– Loosen the lug nuts before raising the car off the ground, then finish taking them off once the tire is raised off the ground. – When finished, tighten the lug nuts by hand, then lower the tire and finish tightening using the tire iron. Wiper blades usually come on and off by squeezing and/or twisting the clips holding the wiper blades to the arms. Be sure to check how your blades are first placed on your car so that you can reverse the process when installing your new wiper blades. The fluids in your car will be contained in reservoirs that use measuring sticks or caps that indicate how much fluid is contained. Some reservoirs are clear and will contain marks on the side indicating fluid levels. Be sure to periodically check the fluid levels in your car or have your mechanic check your fluid levels during routine maintenance services. 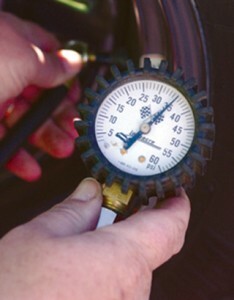 You will need a tire pressure gauge to check the air pressure in your tire. Firmly insert the gage into the valve stem to get the pressure reading. Always do this at least two times to ensure the reading is accurate. Your car’s engine has a series of belts used to operate the car. Look for signs of wear such as cracking or pieces that are torn off. Have a mechanic periodically check your belts and replace them as needed.